We wrap history around ourselves and we use it to define who we are and we sometimes don’t want to face the fact that the stories we’ve always heard may have been flawed or limited or even wrong. One morning I headed toward the Missouri River in search of a Lewis & Clark historical marker. Along the way, I passed through the little town of Waverly. In the center of town was a small park. In the center of the park was a statue surrounded by flags. Yep. I had accidentally arrived in the Land of the Lost Cause. According to the plaque, the guy on the horse was General “JO” (Joseph O.) Shelby, famous for refusing to surrender and riding into Mexico at the end of the Civil War. Jo Shelby was a wealthy Waverly slave owner who became a leader of pro-slavery bushwhackers before the Civil War. He married a much younger cousin, Betty Shelby, which probably explains why the Betty Shelby Chapter of the United Daughters of the Confederacy sponsored this historic plaque. Over the last hundred and fifty years, there’s been little room for regret and shame in the Land of the Lost Cause. Historical land mines like Shelby’s confession get swept under the rug. So we’re left with yet another statue of a guy on horse beneath a Confederate flag. No apologies and no explanation. You can tell this statue is a recent addition (2009) to the Confederate pantheon because the horse is kinda wimpy. Its legs are too long, its head too small, and the ears look like an afterthought. If this monument had been made during Reconstruction or Jim Crow (the peak of Confederate monument building) you can be sure the sculptor would have gotten the horse right. I take hope in Shelby’s mutant equine. Maybe it’s a sign that the flaws of the Lost Cause story are finally coming to the surface. In an article in the Kansas City Sun, Waverly mayor, Barbara Schreiman, said she hadn’t received any complaints about the monument. I hope I’m not the only one who sent that gal a letter. 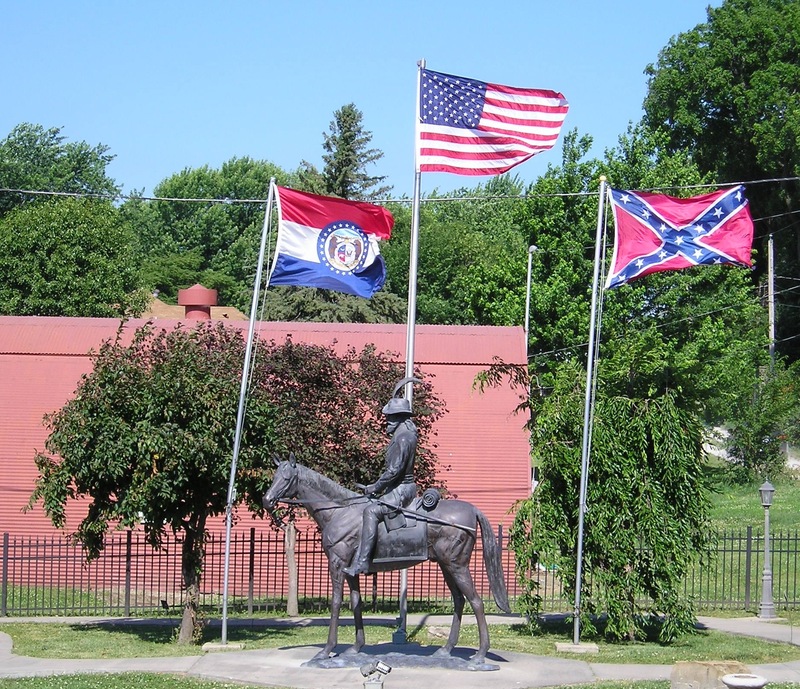 This entry was posted in People, Places and tagged Confederate memorial, Gateway to the West, Joseph O Shelby, Lost Cause, Missouri, Tiya Miles, United Daughters of the Confederacy, Waverly. Bookmark the permalink.